Story by Daniel Yeo/Red Sports. Photos by REDintern Julianna Jothi and Stefanus Ian/Red Sports. NUS Tennis Courts, Thursday, February 7, 2019 — History repeated itself Thursday as Temasek Hall (TH) tightened their hold on the National University of Singapore (NUS) Inter-Hall Games (IHG) tennis crown, taking down Eusoff Hall (EH) 5—0. The two teams had previously met in last season’s finals, where Temasek triumphed, albeit with a much closer score line at 3—2. This lineup change would see Wilbert pitted against his teammate, Marcus Teoh, in the first singles. The two had both represented NUS in the Institute-Varsity-Polytechnic (IVP) Tennis Championships earlier in the season, and it promised to be an interesting match. Wilbert came into the match’s first game cold, though, and found himself immediately under pressure after serving a double fault and whiffing a backhand. Luckily, Marcus would gift him two points back with consecutive forehand unforced errors, and Wilbert blasted a forehand past him to hang on and take the game. In contrast, Marcus’ first game was less of a struggle, as his booming serve and big forehand saw him finish points hard and fast. Wilbert’s unforced errors were costing him, and he let out a cry of frustration after opening himself up to more break point opportunities in the match’s third game. Marcus was quick to capitalise, using a powerful forehand cross-court to break serve, and he was up 2-1. The rest of the set saw Marcus dominate with his groundstrokes, forcing Wilbert further and further behind the baseline as he tried to defend and stretch out rallies. A consistent game saw Wilbert net two break points at 3—2 down, but he could not convert. Marcus closed out the set 6—2 soon after. Into the second set, and the first game in, it looked like not much had changed. With Wilbert standing so far behind the baseline, Marcus used the angles of the court to finish off baseline rallies, outmuscling Wilbert and swiftly breaking his serve for a 1—0 lead. Coming out of the break, Wilbert locked in on Marcus’ backhand, pushing him back with deeper topspin balls and looking to engage him in longer rallies. This forced a tight service game from Marcus with many deuces, but he eventually managed to consolidate his break and take a 2—0 lead. Marcus seemed to be tiring as the rallies grew longer, and Wilbert ruthlessly attacked his weaker wing to keep the set close. At 4—3, Wilbert was only a break down, and he pushed Marcus to another close game. Holding on, Marcus barely escaped the game, but this placed Wilbert under pressure with a game away from losing. Marcus pushed for the game hard, taking the initiative and going for the kill to prevent rallies from dragging out. Finally, after a long and tense match point, Wilbert made the final error for a 6—2, 6—3 Temasek win. The rest of the matches saw a more straightforward outcome. Temasek’s Mark Tang defeated Eusoff’s Neville Koh 6—1, 6—0 in the second singles with some consistent play. In the first doubles, Temasek’s Jonathan Kow and Markus Low found a balance, their solid net play getting them the 6—3, 6—3 win over Damian Chong and Mun Le Yuan from Eusoff. The second doubles was a more tightly contested affair, with both duos needing fast reflexes to win extended net exchanges. Temasek’s Kelvin Chan and Timothy Lee came out on top 6—2, 6—3 over Eusoff’s Ngiam Chee Wong and Koh Yu Rui. Lastly, the third singles saw Yoshio Masuda from Temasek get the 6—2, 6—3 win over Eusoff’s Xu Zhen Nan, but not without a fight. The first set saw Zhen Nan struggle as Yoshio forced him into error after error, and the beginning of the second set saw more of the same as Yoshio broke his serve twice for a 4—1 lead. Zhen Nan didn’t stop fighting, however, stealing a break back whilst delivering the shot of the tie. Approaching the net, Zhen Nan dropped the ball short at the front of the net. Yoshio, accelerating from the baseline, got to the drop-shot and placed a high-arcing lob over Zhen Nan’s head, which should have won him the point. Zhen Nan, however, thought otherwise, and with his back facing the net, hit a Federer-esque tweener. Yoshio could only watch as the pass zipped past him and clipped the back of the baseline, sending the Eusoff team wild. 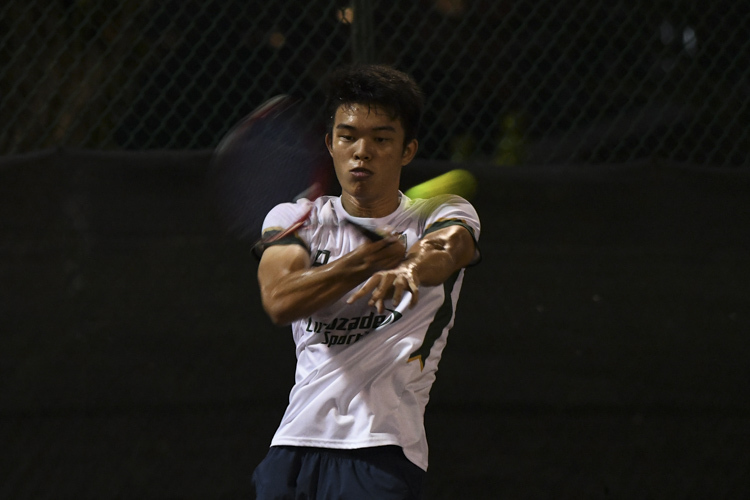 Still, Yoshio overwhelmed Zhen Nan, and he came away with the tie’s final win to secure a 5—0 victory for Temasek and defend their IHG Tennis title. As for the women’s final, TH scraped past Kent Ridge Hall (KR) 3—2 in a nail-biting tie where it all came down to the third singles.